- Installs and concatenates all game resources to hard drive for CD-less play. - Automatically configures and sets up the game to run in DOSBox. - Can download and install the latest version of DOSBox for you. - Now works with other versions of the game. - Movies now start in "High Detail" or No Interlacing. - Hint Keeper works in both versions. - Game does not crash when entering shop in chapter two. - DVD Prep Wizard will convert the installed folder so that the contents can be burned to DVD. The resulting DVD will be complete with a new Phantasmagoria AutoRun and Setup. The game can then be installed from the DVD with the option for full hard drive install or minimal install (DVD required to play, but no disc swapping). Note: select "Yes" when the Wizard asks if you want to uninstall. This is just for cleanup. - Includes a small DOSBox Configuration Wizard to easily change a few basic DOSBox settings. 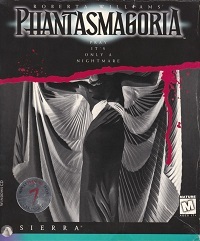 IMPORTANT: DOSBox is required to play "Phantasmagoria". This installer will automatically setup the games to run in DOSBox, but you must have DOSBox installed in a folder named "DOSBox" in your "Program Files"* folder. If DOSBox is not installed in %ProgramFiles%\DOSBox, allow this installer to download and install it for you.